To make our Tankwa Town run smoothly this year, we need to fill over 3700 volunteer shifts – and we’ve had an amazing showing by many people, but we’ve still got a lot of shifts left open that you could help with. Got some time and interested in helping out? Sign up to volunteer here! Why would I volunteer if I have already bought a ticket? There are loads of reasons – firstly, it’s great fun and you get to meet loads of people. Volunteering also gets you involved in the do-ocracy that creates the magic of Tankwa Town. Volunteering also embodies the principles of gifting, civic responsibility, decommodification – and best of all you’ll feel great for doing it. How can I sign up for a shift or three? Please email the volunteer team – or alternatively, sign up at the event by heading over to the Volunteer booth at Off-Centre Camp to see what needs doing. The great feeling that you are a huge part of team. You’ll also receive a MOOP bag and various items depending on how many shifts you complete. If you volunteer for 16 hours or more you will be eligible for a DDT (which means no need to queue the day tickets sales happen). After 32 hours or more, you’re eligible for a reduced price ticket to the 2018 event. Can I volunteer if I’ve never been to AfrikaBurn before? Hell, yes! It’s the best way to learn about how things work, meet new people and complete your experience. Can I choose what to volunteer for? Absolutely: all the available shift descriptions can be found here. Still uncertain? Mail [email protected]. Do I get a free ticket if I volunteer and if not why not? Sorry, no. Only by having volunteers fill over 3700 shifts can we keep ticket prices as low as possible. Can I volunteer during the year for AfrikaBurn? For sure – we welcome it. Get in touch with us at [email protected] to find out how. Can I volunteer for AfrikaBurn during the year if I don’t live in Cape Town? Depending on what your skills are and how you wish to volunteer, we’ll find activities in your area and match you. Please email [email protected] and let them know of your wonderful offer. 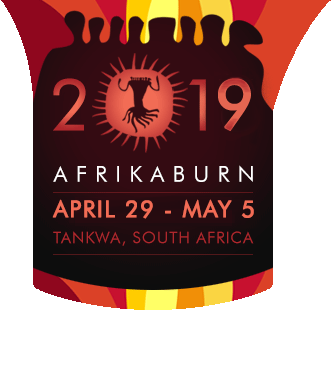 Where do I go to volunteer at AfrikaBurn once I have arrived? Head to Off-Centre Camp (corner 6ish and Binnekring roads) 15 minutes before your shift starts and check in with the friendly Volunteer Booth crew. Can I volunteer if I have not signed up for a shift before the event? Absolutely, yes. Head to the Volunteer Booth at Off-Centre Camp and find out what is still available. One beauty about volunteering is you get to choose how you would like to gift your time. You’re welcome to volunteer for anything that interests you. Shift times vary from 2 hours to 6 hours, depending on what you choose to do. Will I be shown what to do and what is expected of me? Yes in two ways, either by attending a briefing beforehand – which some portfolios do, and others you will be shown the ropes when you arrive. Will there be Ranger and Sanctuary training on site? Yes, and details can be sent to you. The details will also be here on our site and if you missed any of those, then go to the Volunteer Booth and find out when the trainings are scheduled. How can I volunteer for a theme camp? Take a look at the list of registered theme camps here and contact them directly. Can I volunteer for an art project? Sure – mail [email protected] and they’ll get back to you. Is there a volunteer briefing meeting I can attend? Yes. We hold a few before the event in Cape Town and in Joburg. We’ll be putting those dates on our site, on social media and also will email you directly. If I sign up for a shift closer to the time of the event may I change it? If so, how? What if the shift I want to do is full? Consider doing one at another time or looking at the many other volunteer roles available. How can I volunteer with friends? That’s easy. Sign up together or come speak to the Volunteer Booth crew at Off-Centre Camp. Can I see who else is volunteering on any one shift and how? Absolutely – When the shift list system is open, you’ll be able to check your shifts and who else is working with you. If you are at the event and cannot remember come to the Volunteer Booth at Off-Centre Camp anytime – the shifts are on a notice board right next to the Booth. Where can I check to see what shift I signed up for if I forget? Check up on the sign up genius page, when you log in, it will inform you of the shifts you have signed up for. Any problems please write to [email protected] or come along to the Volunteer Booth at Off-Centre Camp at the event.